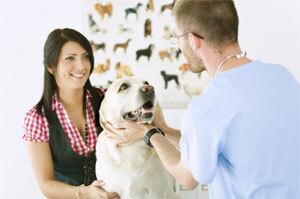 Why should I take my pet for a behavior consultation? With mild or minor behavioral problems, clients are often able to correct the problem by means of reward-based training, as is outlined in the other handouts in this series. However, when problems are more serious, it is easy to make the problem worse rather than improving it. "...a consultation with your veterinarian or a referral to a knowledgeable and properly trained veterinary behaviorist helps you obtain results faster and more effectively." With serious problems such as severe fears or phobias, or with aggressive behaviors that represent safety risks to humans, a consultation with your veterinarian or a referral to a knowledgeable and properly trained veterinary behaviorist helps you obtain results faster and more effectively. In addition, should you require the further assistance of a trainer, both you and your trainer will have guidance on how you should proceed. What will happen during the behavioral consultation? The veterinarian or animal behaviorist will ask you questions about the history of your pet’s problem, including when it began, how long it has been occurring, and what specific triggers cause or worsen the problem. You will also be asked how you have been trying to deal with the problem. Finally, the behaviorist will discuss the treatment strategy that is most appropriate for your circumstances. The more detailed and objective your information is, the more likely that the behaviorist can reach a diagnosis or tentative diagnosis of the problem and formulate an appropriate treatment plan. Who should be involved with the behavioral consultation? It is ideal if all members of the family are present during the consultation. In this way, each member can tell the behaviorist what he or she has observed,and all of the family members can participate in the discussion. For dogs, if you are working with a trainer, check with the behaviorist to see if it might also be advisable to invite the trainer to the consultation, because some trainers may use techniques that are consistent with what you want to accomplish and others may be counterproductive. "Veterinarians and animal behaviorists are trained to observe behavior and body language of animals and can determine whether the animal’s reactions to a situation are typical and/or normal." Once all the information is gathered, the behaviorist can then discuss the treatment plan with everybody involved and ensure that each family member understands how the pet will be treated. Will I need to bring along my pet? It is important for the behaviorist to observe the pet, as well as determine what sort of relationship there is between the pet and each family member. Veterinarians and animal behaviorists are trained to observe behavior and body language of animals and can determine whether the animal’s reactions to a situation are typical and/or normal. The behaviorist will observe the general demeanor of the pet, as well as the pet’s response to specific test situations. Other pets within the home may also have an impact on the expression of problem behaviors and, if they can safely be brought to the consultation, they may need to be included. Please ask your behaviorist if this is necessary in your situation. The pet’s behavior in the clinic environment may not be representative of the normal behavior when at home. Therefore, it is important for you to let the behaviorist know whether your pet’s reaction is similar to its reaction at home. In most cases, videotapes of the problem situation can be useful to help the behaviorist understand the pet and the actions within the home context. Never provoke the pet to get video footage; safety for family members and other animals must be the first priority. What will be involved in the treatment? "By going to a behaviorist, your family will all become part of the solution for helping your pet become a better member of the family." In all cases, some sort of behavior modification program will be recommended. If your pet does not have basic obedience training, you will need to start with this step. Then, depending on the situation, the therapist will teach you how to modify your pet’s behavior by means of techniques such as desensitization, counter-conditioning, response modification, shaping, or other appropriate means. In addition, various management techniques may be used to avoid the triggers for problem behaviors and to keep people and other animals safe. In some cases, drug therapy may be necessary. Why can’t I just send my pet away for training? You and your family are the key to modifying and managing the behavior and reactions of your pet. In many cases, the environment plays a role in the development and maintenance of problem behaviors. Training in another environment may not have much effect on the behavior in your home. Having a trainer or another person teach the dog how to behave does little to ensure that you will have the necessary control over the pet once it returns to your home environment. It is important not only to modify the pet’s behavior, but also to teach all the family members how to maintain this training properly, using a combination of positive and negative reinforcement. By going to a behaviorist, your family will all become part of the solution for helping your pet become a better member of the family.